CARVICO, world leader in the development and production of latest-generation non-run stretch fabrics, presents at EUROBIKE a preview of the results of the exclusive field wear-test realized in collaboration with INVISTA – owner of the LYCRA® brand – and dedicated to the launch of VITA fabric with LYCRA® SPORT certification in the technical sports clothing for the cycling sector. After three months of intense athletic activity, garments made using Carvico’s VITA fabric with LYCRA® SPORT certification that combines high compression power with extraordinary comfort, looked like new and offered all their original shape retention qualities and compression strength. A choice in line with Filippo’s personality and his willingness and courage to always experiment in the world of cycling. The same values shared by his team Wilier Triestina – Southeast, which has launched many new faces in the world of professional cycling. A commitment that brought the team led by Angelo Citracca to win two editions of the Italian Cycling Cup in a row. An innovative, high-performance product, VITA fabric has been awarded with the special LYCRA® SPORT certification, a hallmark of quality that can only be displayed by fabrics scientifically engineered to deliver exceptional comfort, fit and support for active-wear garments. VITA with LYCRA® SPORT provides an outstanding compression performance and stretch flexibility. Its ability to contain muscle movement means it can help athletes limit the amount of energy they waste, leading to improved performance. In the words of Carvico Group CEO Stefano Eretti, “Only by exposing our fabrics to real-life fatigue, sweat and wear and tear – all part of a competitor’s everyday experience – can we develop truly effective, high-performance solutions. 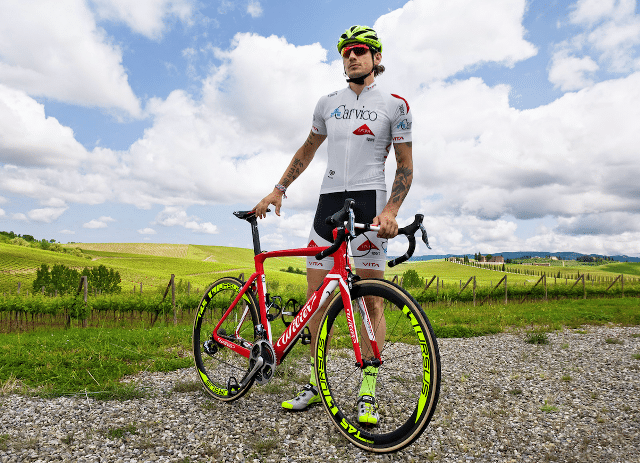 We’re honoured and pleased that such a high-calibre sportsperson as Filippo Pozzato has chosen to work with us. This kind of confirmation only goes to show that together with our long-standing partner the LYCRA® brand, we are working in the right direction to introduce cutting edge materials“. And finally, Edy Figini, Head of Marketing for INVISTA Italy, adds, “Once again we’re working side-by-side with Carvico in a significant new project we have great belief in. Our LYCRA® SPORT brand has been developed with the aim of offering all the innovation and hi-tech value possible to a segment with such specific requirements – active sport. Vita and Filippo Pozzato are the perfect embodiment of the passion for challenges that is such a fundamental aspect of our activities”.